Using a deep fat fryer isn’t an option when I fancy chips. So instead of having a potentially dangerous appliance on the go, I bake our fries. This week our Family Income Supplement ran out. We still qualify, we just have to wait for it to be renewed, which could take up to 6 months, although I’m praying it doesn’t take that long. Living on a budget isn’t easy. Everyday I’m faced with choices about where to shop, what to buy and looking at our bills. Yesterday while walking home with the boys from school we passed the local Chipper. If you’re from Ireland you will know the allure of the scent of heady vinegar mixed with warm potato chips (fries if you’re from the US) wafting from the front door as you walk past. There was the temptation of just walking up to the counter and ordering a “single” of chips with “sore finger” (so named because the combination of lashings of each gets into cuts you didn’t know you had on your hands). I had a yearning to pass the piping hot and soggy brown paper bag from hand to hand, juggling individual chips as I puffed on them to make them cool enough to devour on the walk home. Then I remembered I’d used the last of my change to replace my hubby’s much-loved cafetiere which Eóin had broken by accident the night before. I got home and considered pulling out the little used deep fat fryer but with 2 small boys lamping about the place (it’s a technical Dublin term for being a handful), it’s not really an option. 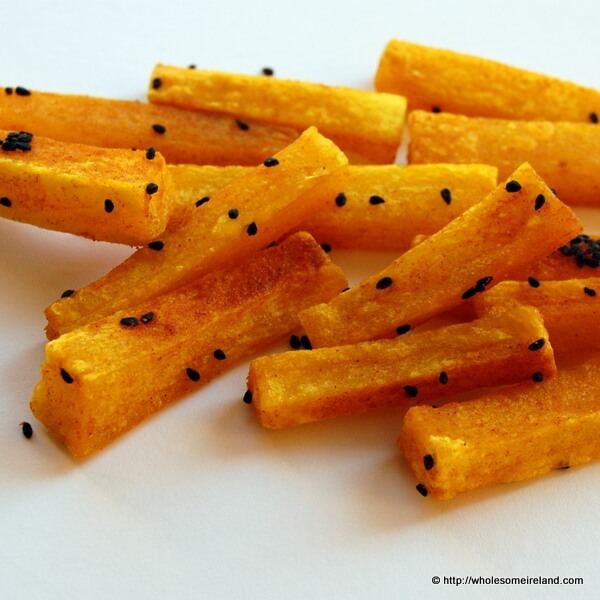 So instead I doused some handcut chips with a combination of sunflower oil, tumeric and onion seeds (also known as Nigella seeds). Then baked for 45 minutes at 150 degrees Celcius in my fan oven. 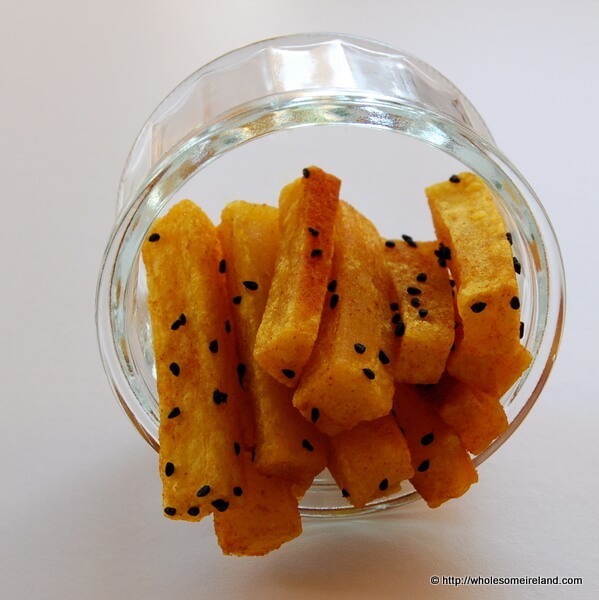 The resulting chips are crispy on the outside, fluffy on the inside, beautifully golden and moreish. I’m glad I didn’t go to the Chipper now. Mind you I will always be tempted when I walk past but these baked potato chips / fries are just as nice. I’m proud to say that my American children always say “chips” when they should, by rights, say “fries”. We’ve confused more than one waitress when ordering. Of course, that’s the only thing I’m proud about in that statement. Never mind; your chips look amazing. You don’t parboil the spuds first or anything? Any magic tips for making them perfect? Or is it down to the type of potato? Hi Maud. No I don’t parboil them first at all. Just make sure that they are washed with cold water, then patted dry so that the oil sticks to them. The type of potato helps. I use Roosters or similar – basically a waxy potato – as they make for better chips. Floury ones aren’t great. The best tip I can give you is to try and get them the same shape & size pretty much because that will help them all cook evenly in the oven.